Jazz Angels is now eligible on Amazon Smile! Amazon smile is a division of Amazon where certain purchases you make qualify for a donation to our nonprofit charity. It costs nothing extra. When you login to smile.amazon.com, you can register to have a small percentage of your purchases benefit Jazz Angel Inc (our official business name). Just use the "smile" page when you log in, then shop Amazon like you normally would, and the Jazz Angels will get a periodic contribution. It's that easy!Donate Now! Located in Signal Hill, California, next to Long Beach and close to the 405 freeway on Willow Street between the Cherry and Lakewood exits. 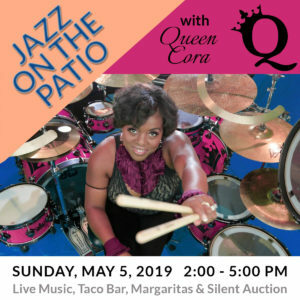 Get Tickets to Jazz on the Patio!